Thinking about upgrading or repairing your property’s guttering in Sandbach? Steve Emery Roofing Specialists can do that for you. We like to set ourselves apart from the competition by offering roofing services like no other. Using only the highest standards in the services we provide and the materials we use, we employ our expertise into every task we undertake in all sectors spanning from the domestic to the commercial. Your unique situation will be handled by administering bespoke solutions. Personal service at affordable prices is only one of the benefits you’ll enjoy from us. We like to ensure continuity in the type of work we do; that is why we use our own staff to do the job. This way, you are kept updated accordingly and are always in the know. You might be wondering what the correlation is between gutters and roofs. In Sandbach, guttering issues can be detrimental to the integrity of the house. Water running off from the roof can leak down the walls if the gutters are not properly secured to the walls. By doing so, they degrade the walls and since water is not being drained properly, it can cause flooding in basements. 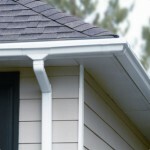 Having gutters in proper working condition helps to promote proper water drainage. This includes unclogging the gutters. Blocked gutters caused by leaves or other items accumulating in the pipe can result in pooling on the roof, which can then damage the tiles and cause roof leaks as well. At Steve Emery Roofing Specialists, we offer a full gutters and fascias service through our quality UPVC gutter, fascias and soffits. Not only are they practical in terms of function, but they also revamp the look of your property. We use quality, maintenance free products for guttering in Sandbach. These products are perfect for use in British weather as they are extremely durable. Contact us today for your guttering needs. We offer a free estimate upon inquiry. All the materials we use comply with the current BSI specifications. We also offer a variety of roofing services, including chimney work, fibre glass roofing and repairing damages caused by storms.